Welcome Spring!!! Use those frozen cranberries you have leftover from the holidays to create a flavorful bread with a fresh burst of Spring. The cranberries rise to the surface while baking and create a sweet/tart topping for the bread, especially when you add the sugary glaze after baking. These loaves freeze especially well, so if you have a large mixer, make the full recipe and you’ll have a nice treat for transitioning into warmer weather. Cut only the slices needed with a large chef’s knife and you won’t have to thaw the entire loaf. I love the color and flavor of fresh cranberries and try to keep them in the freezer year-round for Baked Cranberry-Blueberry French Toast, Pumpkin-Cranberry Bread, Cranberry-Blueberry Ricotta Pancakes, or Cranberry-Jalapeno Preserves (a hot pepper jelly which I sell in our gift shop). They can usually be substituted for dried cranberries as long as your recipe includes plenty of sugar to temper the tartness. Preheat oven to 350 and prepare (4) 4X8 or (3) 5X9 loaf pans by spraying with a light coat of cooking oil and dusting with flour. Reserve 1/4 cup lemon juice for glaze. In a large mixer, beat eggs, oil & 4 1/2 cups sugar, remaining lemon juice, and all lemon zest. Add baking powder & salt, mixing well. Add flour alternately with buttermilk and mix well. Add cranberries and mix until evenly distributed. Pour into prepared pans and bake at 350 about 1 hour until toothpick comes out clean. Cool 10 minutes in pan, then remove to wire rack. While still warm, glaze with 1 cup sugar mixed with 1/4 cup lemon juice. Special Note: Spoiled milk products such as half and half or regular milk work well in this recipe as a substitute for the buttermilk. However, fat free products can sometimes cause the cranberries to sink rather than rise. 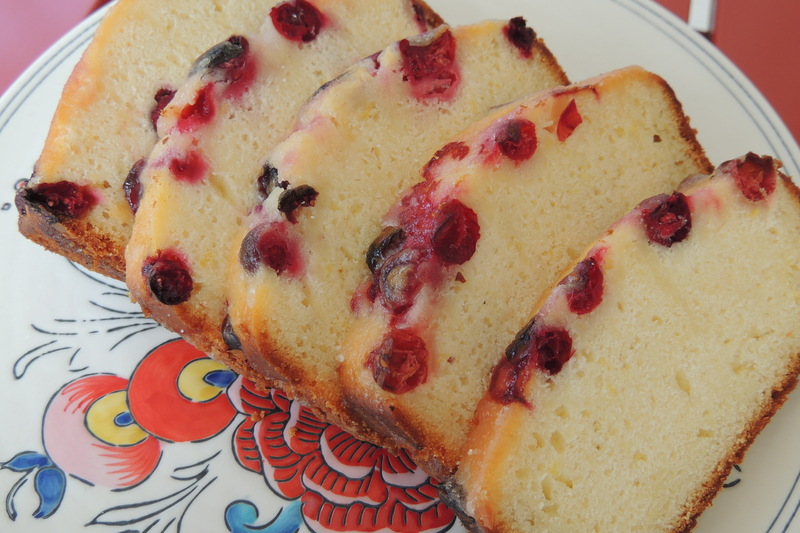 If using fat-free skim milk or fat-free buttermilk, eliminate the cranberries, glaze as directed, and you will have a delicious, healthier version of lemon pound cake!! Bon Appetit and Happy Spring! !